The Wilmington mayoral candidates faced off in a heated debate at Delaware Technical Community College in Wilmington Wednesday, where the eight Democratic candidates talked crime and public safety. 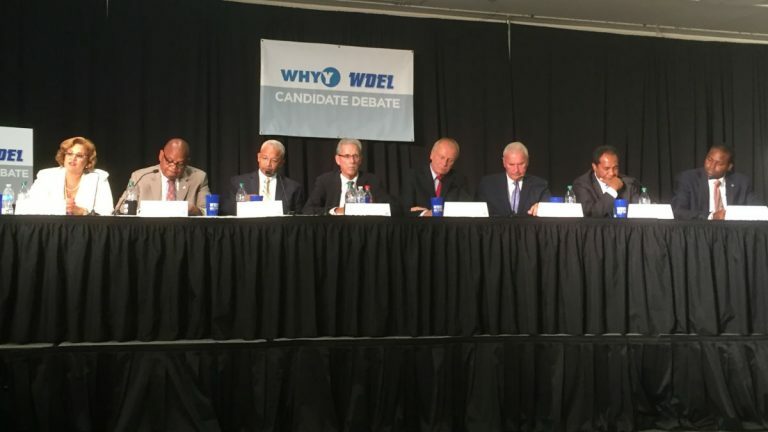 This was the first debate, hosted by WHYY and WDEL, that incumbent mayor Dennis Williams attended—and he received attacks from several of his opponents. Prior to the debate demonstrators stood outside the building and attacked the mayor for not offering Wilmington police officers a pay raise or contract in five years—the decision not to offer raises is now headed to Delaware’s Supreme Court. During the debate Williams said providing the 3 percent increase would place a financial burden on the city. Wilmington City Councilwoman Maria Cabrera, former Wilmington City Councilman Kevin Kelley and non-profit leader Eugene Young all said they would support a pay raise for the police and fire departments. Candidates also discussed who would lead the police department if they’re elected. In January the city hired former Philadelphia Police Commissioner Charles Ramsey to oversee community policing. When asked if they would keep him if elected, most of Williams’ opponents said no. “Your question would assume I know what Chief Ramsey does,” said Wilmington City Council President Theo Gregory. Former City Councilman Norm Griffiths said he would evaluate Ramsey’s work before making a decision. Marshall said he would conduct a national search for a new police chief. Many opponents of the Ramsey hiring argue the decision was a waste of money that should have been spent on areas like officer pay raises. She said she’s already selected her police chief, but declined to name that person because he already has a job elsewhere. Gregory said his police chief would be hired from within the department. 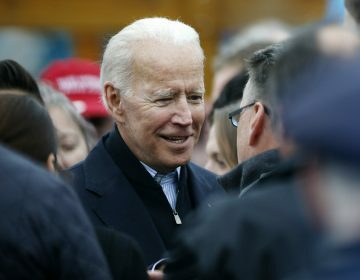 “I think there’s a morale issue, I think people should have upward mobility, I think if you bring in a chief from outside they don’t understand the culture of the police department,” he said. Kelley said he would create a holistic approach to crime, and incorporate more community police officers. All the candidates expressed the need for more prevention programs for youth and at-risk residents. Mike Purzycki said he would seek funding from the public sector. Williams said he will “continue to do what we’re doing,” such as expanding parks and recreation, and creating mentoring programs for youth. He said he believes the city also needs to help parents who are substance abusers. Williams said he believes in creating opportunities for residents so they can lead a successful life without resorting to crime. “You can’t arrest your way out of this problem,” he said. 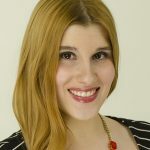 Wilmington residents will decide if they want to re-elect Williams during the September 13th primaries. Williams said as mayor he’s overcome several hardships—such as the Matusiewicz courthouse shooting, police shootings, extreme weather and water main breaks.